The kitchen and dining cabin at Bearpaw Meadow. The frying pan serves as a dinner bell. Bearpaw is a full-service camp 12 miles east of Giant Forest on the High Sierra Trail. The camp is dramatically situated at the edge of the high country, on a precipice overlooking the craggy granite peaks of the Great Western Divide. The camp is quite small, with 6 tent cabins that can accommodate up to 12 guests. A full-time staff of five provides fresh-cooked breakfasts and dinners, hot showers (rigged so you can’t leave the water on continuously), and a flush toilet. Despite these amenities the camp is very rustic. It’s definitely a camp and not an inn, and the tents in particular are very basic. 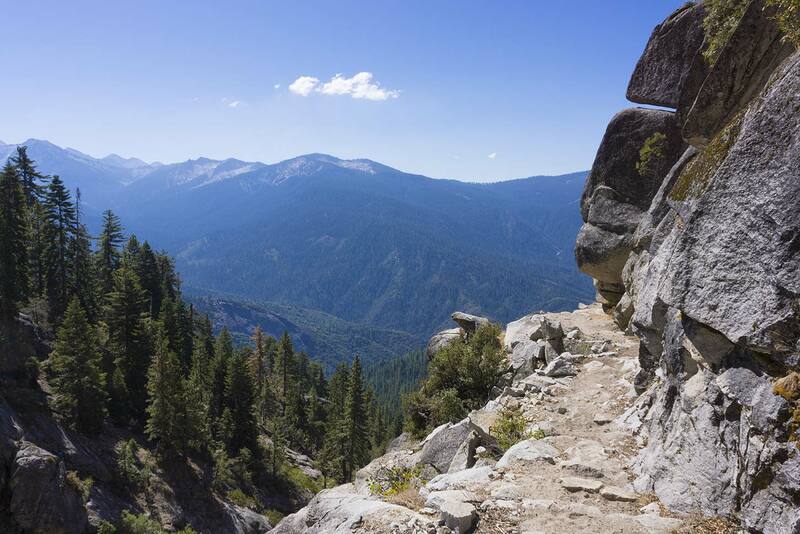 But that’s the point: Bearpaw is a perfect way for day hikers to get an immersive Sierra wilderness experience that would normally require backpacking. 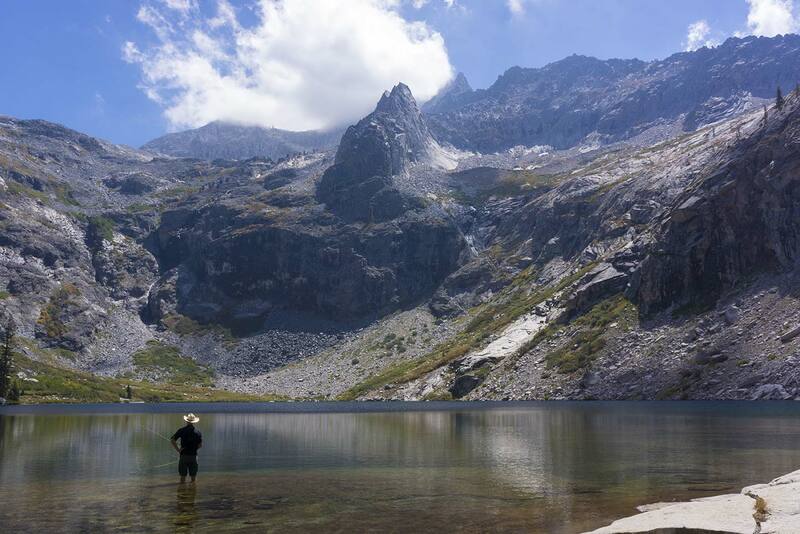 Guests at the camp can go for hikes in the grandeur of the High Sierra, trekking through alpine meadows, on trails cut into sheer vertical cliffs high above conifer-clad valleys, past glacial lakes, among immense granite cliffs and peaks. The best part of the day, though, is coming back to the remote encampment where the staff is hard at work preparing dinner and chopping wood for hot showers. The camp was established in 1934 and it seems like little about it has changed since then. Supplies are brought in by mule train twice a week. There’s no electricity; the tents are lit by oil lamps and the dining cabin by gas lamps. Food is stored in propane-powered refrigerators. Water comes from a nearby mountain stream and is filtered for drinking. The whole camp is disassembled every fall and stored in a stout log cabin. Dinners are extraordinary. 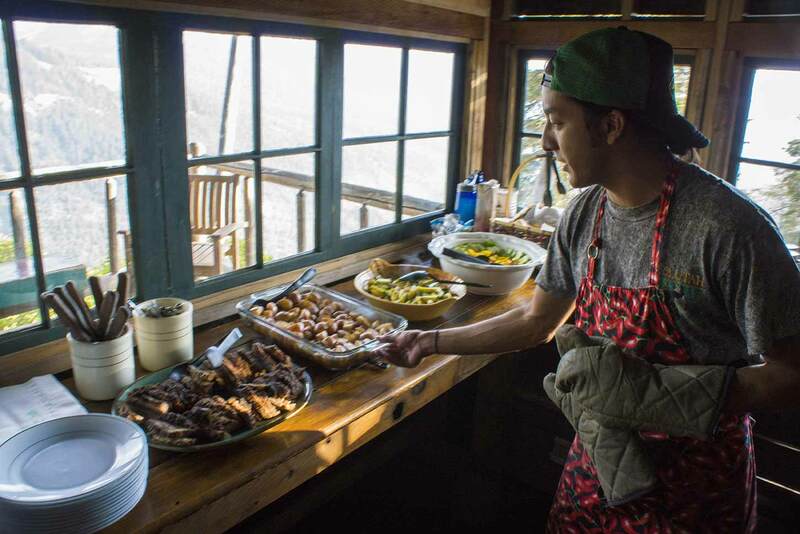 They’re prepared by a single cook each day, and the cook has the freedom to make whatever he or she wants, so the food has none of the institutional feel of most national park dining facilities. It’s very much like home cooking. It also helps that the food is prepared in small batches, since there are only 12 guests at most. The camp has five cooks and they rotate, so dinner each day is made in a noticably different style, though it’s always hearty and nutritious. Dinner is served buffet-style and there’s always plenty of food. Breakfasts are likewise excellent and include hash browns, scrambled eggs, bacon or sausage and some kind of fresh-baked coffee cake or bread. Orange juice (frozen concentrate) and coffee are also provided. Eating breakfast in the little chalet while the sun rises over the mountains is definitely a highlight of the Bearpaw experience. Boxed wine is available for purchase, and lemonade and homemade brownies are available throughout the day. For lunch, you can purchase a sandwich or a wrap made from leftover meat from dinner, or a peanut butter and jelly sandwich. Mike serves a superb dinner of barbequed tri-tip, red potatoes, squash, salad, and onion bread. He also made peach pie with walnuts for dessert. Breakfast is served at 7:30. Hot showers are available from 2:30 until 5:30, and dinner is served at 5:30. The shower and toilet facilities are surprisingly clean, much cleaner than at Lodgepole or Cedar Grove. However, there’s no maid service for the tents. Towels and washcloths are provided and there’s a jug of liquid soap in the showers. The beds are provided with comforters which are really quite warm. The camp is open from early June to late September. Reservations for the year can be made starting on the first business day in January at 7 am; the entire summer is pretty much sold out by about 9 am. However, there are a lot of cancellations, and open dates are posted on the camp’s website every weekday. The staff, who are mostly young backpacking enthusiasts, don’t really mingle with the guests, although they’re nice enough if you talk with them or ask what’s for dinner. 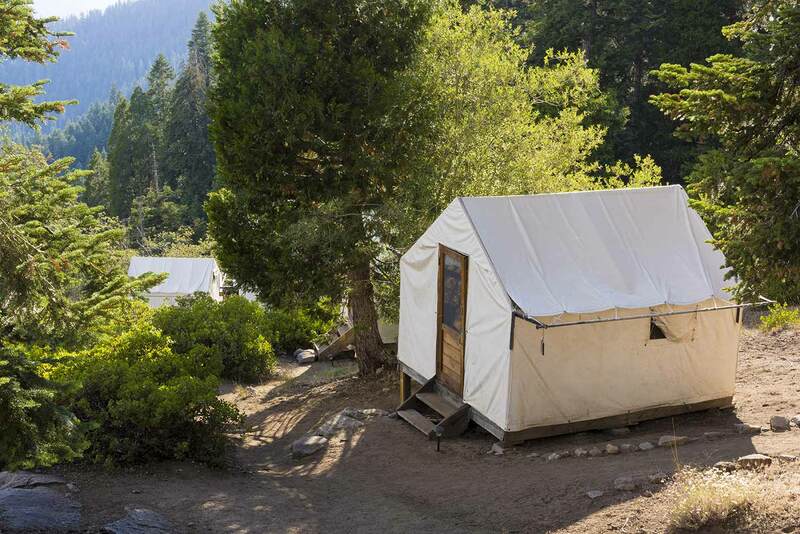 Although there are other High Sierra camps, none offer the unique mixture of amenities and rustic appeal found at Bearpaw. 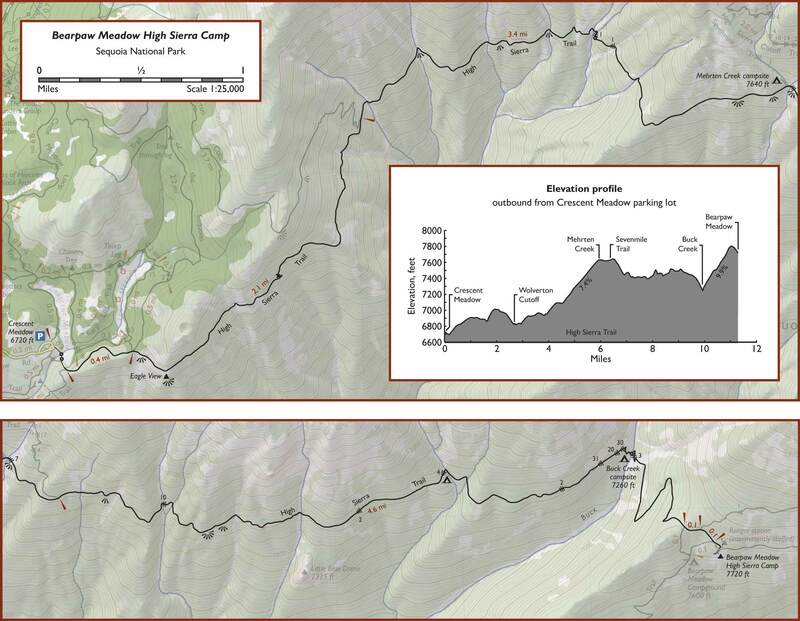 Yosemite has five High Sierra Camps which are much more basic than Bearpaw; they which each accommodate about 36 guests, and tent cabins are shared with other hikers dormitory-style. At the other extreme is the Sequoia High Sierra Camp in Sequoia National Forest, which accommodates about 72 guests and aims to be more like a luxurious inn; it’s only a half-mile hike from the parking lot, and at dinner dishes can be ordered off a menu. The hike starts at the Crescent Meadow parking lot. A wilderness permit is required and can be obtained at the Lodgepole Visitor Center between 7 am and 3:30 pm. The permit is free for Bearpaw guests. With the permit you can drive to Crescent Meadow even on summer weekends, when the road is closed to other visitors. 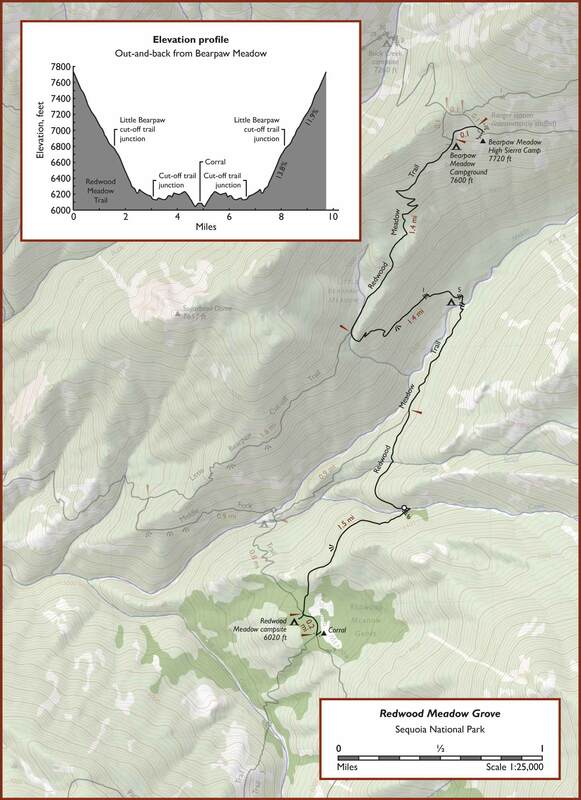 The hike to Bearpaw is a surprisingly difficult 12-mile trek. Although a sign at the trailhead says the trail was built to minimize elevation changes, the trail still has quite a bit of climbing: 2,000 feet of elevation gain outbound and 1,300 foot returning. The altitude and extra weight don’t help. The first segment of the trail, from Crescent Meadow to Wolverton Cutoff, is the most scenic. After a brief hike through the Giant Forest and up a wooded slope, the trail breaks out into the sunshine. There’s a fine view down-valley to Moro Rock and the arid-looking foothills, as well as across the valley to the spires of Castle Rock, and up-valley to the much lusher, conifer-clad River Valley terminating in the dramatic, craggy Great Western Divide, perfectly spread out in front of the trail. Bearpaw Camp is on the ridge that’s clearly visible just in front of the Great Western Divide. 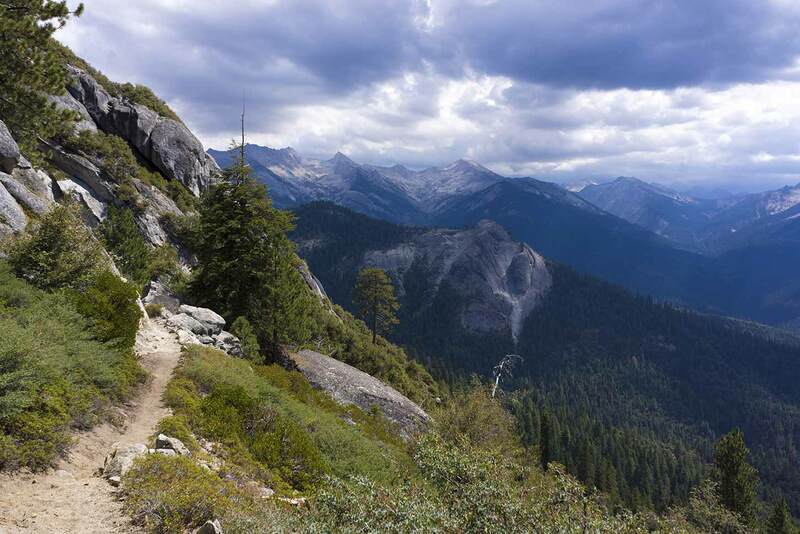 The trail proceeds through lush, open, light-filled forest with more views up-valley. After Wolverton Cutoff, the trail ascends through patches of dense forest interspersed with exposed stretches. It’s a pretty good pull up to the Mehrten Creek Trail intersection. After that are several hazardous sections where the trail is cut into a sheer vertical cliff with nothing to keep you from falling off. There are a few such sections before Mehrten Creek, too, but the scariest ones are between Mehrten Creek and Buck Creek. Despite the cliffs, from the Wolverton Cutoff until the beginning of the final climb the scenery doesn’t change very much and the trail can get a little monotonous. The trail descends to a creek crossing with a footbridge, then begins the final ascent to the ridgetop. This is the most challenging part of the hike. This part of the trail is densely wooded and there aren’t any views; much of the ascent is in a hidden ravine that doesn’t show up on topographic maps. Hamilton Lake is the star attraction of the Bearpaw area. The section of the High Sierra Trail between Bearpaw Camp to Lake Hamilton is extraordinarily scenic. 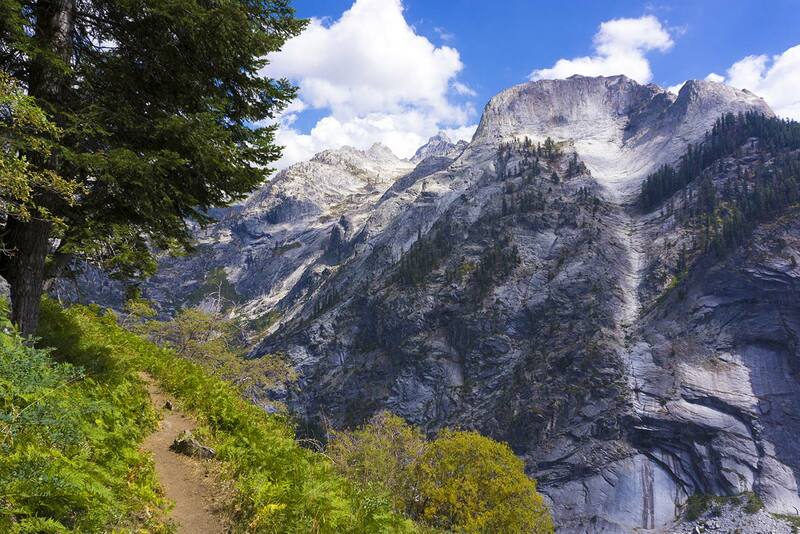 Throughout the hike are superb views of the craggy granite peaks of the Great Western Divide. Pictures don’t do the trail justice; the immense scale of the sheer granite peaks and cliffs that the trail winds among can’t be captured in photographs. From Bearpaw the trail at first descends through dense pine woods that aren’t especially interesting, but within a half-mile the woods become surprisingly lush, with a vivid green groundcover replacing the dead pine needles of the Bearpaw area. The hillside becomes steeper, sloping off more and more steeply to the right, and the woods thin out, soon allowing views of the grand peaks. The trail runs high along the wall of a dramatic canyon, allowing excellent views. The trail bottoms out at a footbridge over a vertical-walled granite gorge. This is a popular turnaround point; an out-and-back walk to the footbridge is an outstanding 3.2-mile option and is highly recommended for anyone who just wants a short hike. Past the bridge, the forest gives way to bare granite. The rest of the trail is cut into exposed south and west-facing granite slopes and can get very hot, often into the 90s. The trail switchbacks a few hundred feet up the mountainside and then levels out. The level portion gets rather vertiginous, with no protection from the sheer drop-off. Perversely, the trail descends for a while before reaching a flat, level granite outcropping with a creek flowing across it and an impressive view down the conifer-clad River Valley (this creek might be difficult to cross during early summer afternoons). The trail then begins to switchback uphill again, eventually passing the small algae-filled little Lower Hamilton Lake. Past the lake, the trail continues to climb, then finally tops out as Hamilton Lake comes into view. Hamilton Lake is located in an impressively large granite bowl (although not a cirque, it nonetheless looks just like one). A small waterfall flows into the opposite side of the lake and cloud-shrouded peaks rise high above. There are some campsites on the flat granite shore. 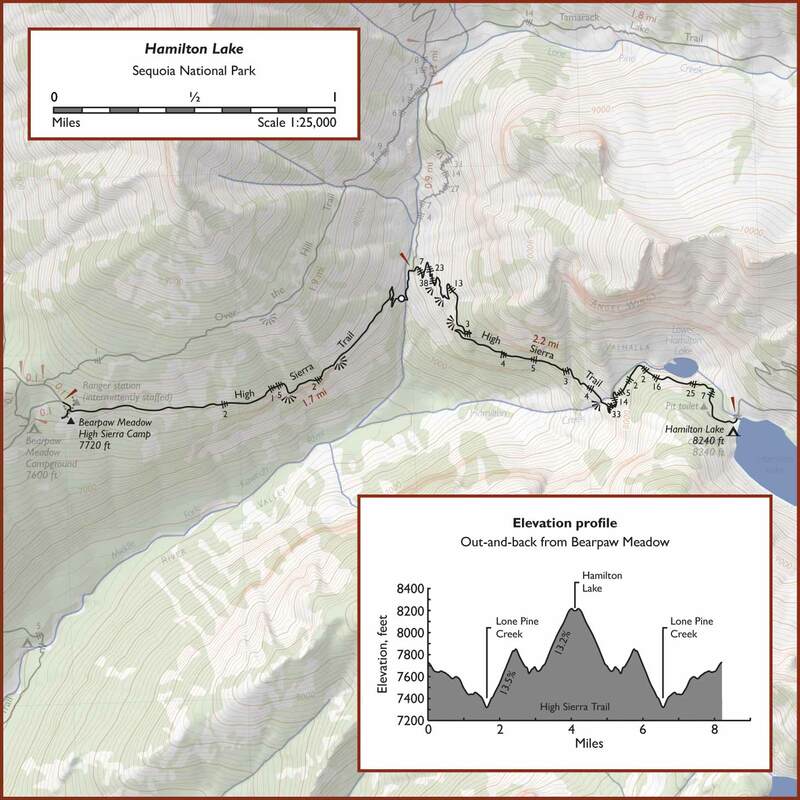 A superb alternate route, which adds 1,000 feet of climbing to the Hamilton Lake hike, is to make the hike a partial loop by taking the Over-the-Hill Trail toward Elizabeth Pass, then descending on the Elizabeth Pass Trail back to the High Sierra Trail. The Over-the-Hill Trail starts in pine forest and climbs into attracative meadows with superb views of the Great Western Divide. The trail then descends into a rocky valley, where it ends at the Elizabeth Pass Trail. To the left, the trail leads to an especially pretty meadow in a glacial valley decorated with sparse sprays of pine trees. To the right, the trail is somewhat less interesting, switchbacking down a rocky hillside to end up in a grassy valley. Redwood Meadow is one of the most remote old-growth sequoia groves that can be reached by a trail. 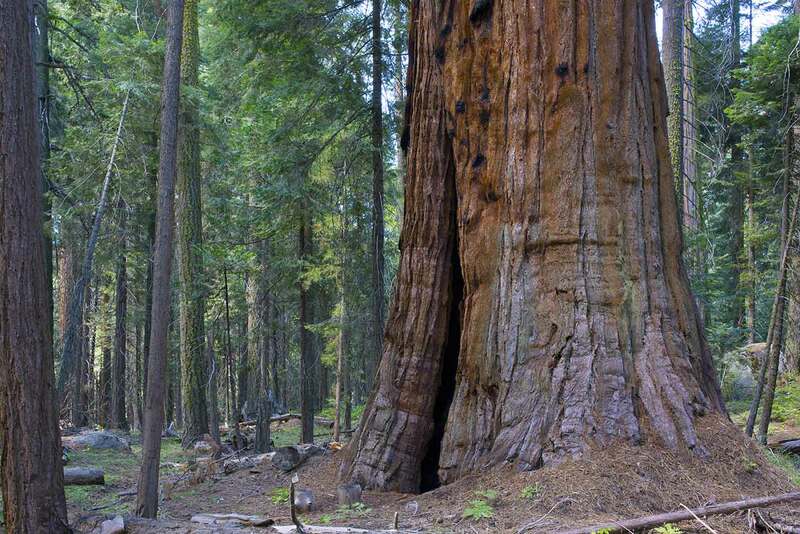 Although its remoteness makes it an intriguing destination, the grove isn’t especially spectacular; only about half a dozen big sequoias can be seen from the trail, plus some smaller trees. The meadow itself is scenic, ringed by mostly small sequoias, but it’s somewhat incongruously surrounded by a fence to keep horses out. From Bearpaw Camp, the sandy trail descends through dense pine woods. It passes through the backpackers’ campground, which, located in somewhat dusty woods with no groundcover and no views, isn’t nearly as scenic as the High Sierra Camp. The trail isn’t especially scenic as it continues to descend below the campground, but it is cool and shady. The trail passes through a shallow ravine that isn’t apparent on topographic maps. After the intersection with the Little Bearpaw Cut-Off Trail (the sign says "Middle Fork Trail"), the trail descends more steeply down a wooded hillside to a creek crossing. The creek is wide and deep enough that it may need to be forded even when the water is low. When the water is high, it may not be crossable at all. After the creek crossing the trail levels out and proceeds through sunny, open woods. This is the most pleasant and enjoyable section of the trail. It has some nice views of the Great Western Divide, which is now high above the trail, as well as down-valley views to Moro Rock. The trail descends into the Redwood Meadow Grove, arriving at a trail intersection that marks the best part of the grove. Right at the intersection is a campsite, which is located under two big sequoias. Each of the three trails that radiates out from the intersection passes by one large sequoia before leaving the grove, except for the trail to the left, which passes by two. Some other large sequoias can be glimpsed at a distance. 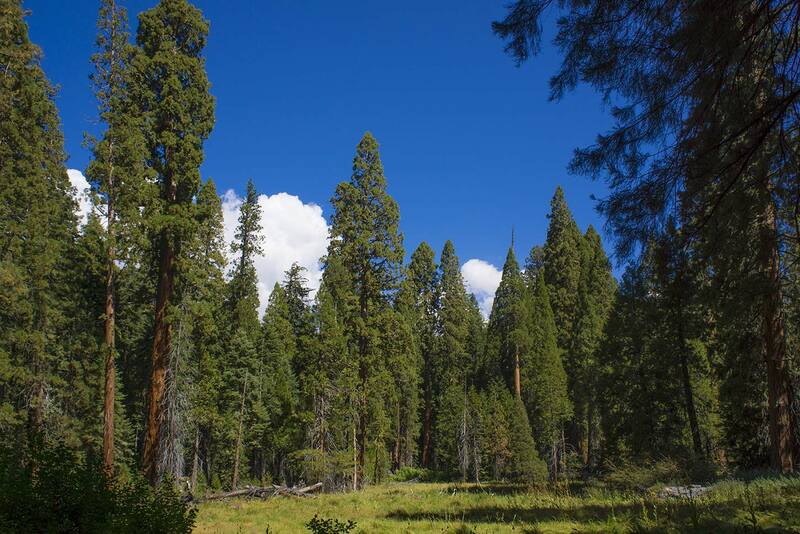 The grove is located at a middle elevation; like a low-elevation grove, it’s dense with small non-sequoia trees; like a high-elevation grove, much of it lacks groundcover. The redwood meadow can be briefly glimpsed just before and after the campsites. Just past the campsite, on the trail to the left, is a large horse camp with two sizable cabins and a corral. The grove is wonderfully quiet, at least when the horse camp isn’t in use. Here are a few more photos of the Bearpaw camp and day hikes. The official website has reservation information, photos, and a description of the camp. Alice Q. Foodie has an extensive 2-part blog entry on and photos of Bearpaw Camp. This Los Angeles Times article is from 1997, but other than the price the camp hasn’t changed at all since then. Ray’s Adventures has a blog entry on Bearpaw Camp. For several more points of view, see TripAdvisor’s Bearpaw page. There’s also a helpful review on Yelp.